The Bel Air provides a breathable mesh backing that allows for air ventilation and natural cooling. Paired with a highly cushioned seat, it offers the ultimate in comfort. 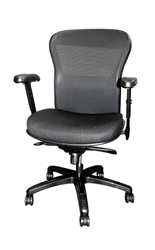 Additional features include an easy-to-use lumbar adjustment, height adjustable arms and contoured polyurethane pads. Seat Ht Range: 18"- 21"